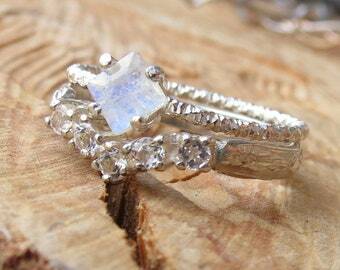 A Rainbow Moonstone cabochon Bridal Set in Sterling Silver. 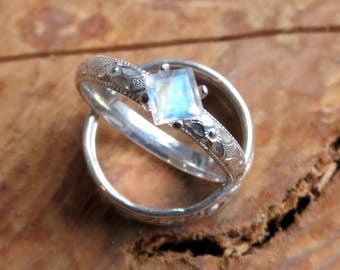 The diamond pattern promise ring bezel set with a 5mm blue flash natural moonstone gemstone in a bright silver finish. A simple but detailed band makes this ring really special. 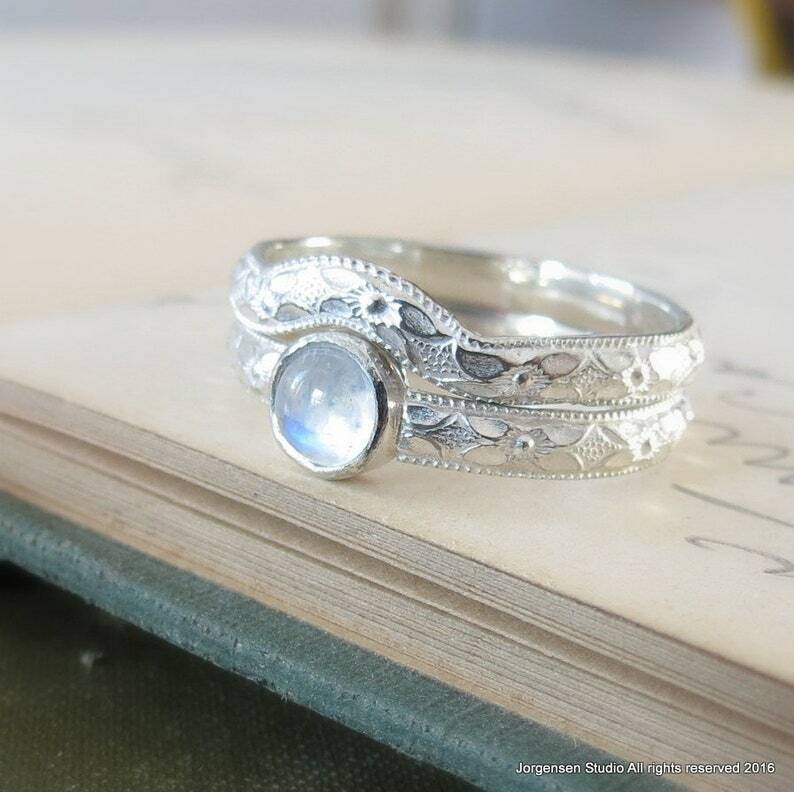 This ring can be a promise ring, and engagement ring or just on the right hand for the moonstone lover with two curved bands would be a lovely stacking set. 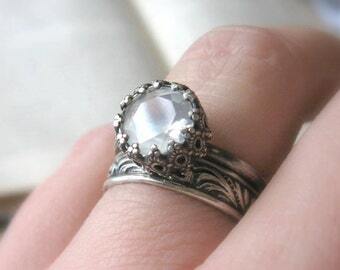 The ring is handmade entirely of sterling silver. The band is a richly engraved slightly floral & geometric diamond pattern. The bezel setting is a very simple tube setting that raises the stone up a bit. The band is about 3mm wide and the gemstone is 5mm across. 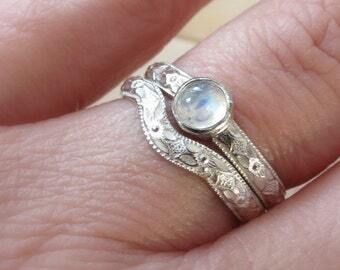 This can also be made in an oxidized finish which will set off the moonstone even more. 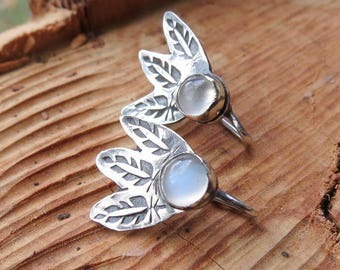 You can order the moonstone ring alone or in the set, which ever you prefer. 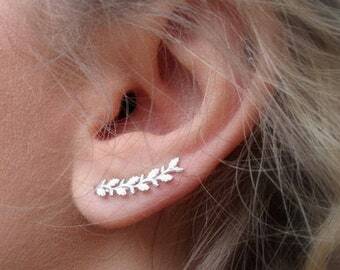 They are made to order in sizes 4-10 - if you need a larger size please contact me for a custom order. 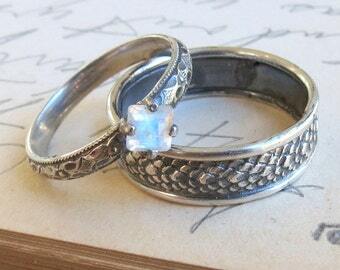 ***Be sure to add your ring size to the box for notes on the Etsy check out page. It takes approx. 7-9 business days to complete before shipping. This ring is also available with other gemstones such as white topaz, peridot, amethyst, citrine, garnet, and blue topaz. See my shop for other options or contact me for something custom. Please see my shop announcement and policies page for additional important information.